Orchids and bromelaids were almost made for Miami. They are beautiful tropical plants that love hot, wet somewhat shady environments. Come see our extensive selection today! Did you know that in the wild, both orchids and bromeliads often grow attached to trees? All of these species come in a variety of shapes and colors. In fact, there are over 2800 known species of bromeliads alone. While we certainly don't carry all of them, we're sure you'll find one that's perfect for your yard or garden. As for orchids, they can do well indoors and outdoors, and they make a lovely gift for both people you love, and people you work with. 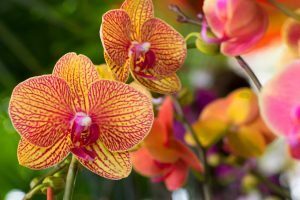 We have everything you need to get started in growing your own orchids. From full grown plants, to seeds, soils and fertilizers. We carry some of the most popular orchid species, including Phalaenopsis Mini orchids! 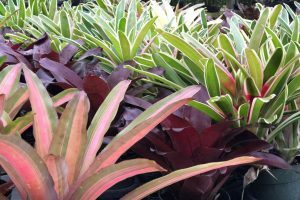 Our bromeliad selection ranges from full sun varieties, to species that prefer a shady environment. So no matter where you're looking to add depth and color around your home and garden, you'll find just what you need in our garden center.